The 5-day trip will give you an unforgettable experience with interesting place sites in the North of Vietnam. It will bring you to natural landscape to discover outstanding features in Halong Bay. Spending 1 night on Halong Bay at luxury cruise will make you have a wonderful time in Vietnam. - Enjoy many specialities of Hanoi’s food. - Have dinner at a local restaurant. Free at leisure and overnight in Hanoi. - After breakfast and check out, transfer to Ha Long bay. Arrive in Halong Bay at the jetty around at noon. Our crew welcome you on board the Deluxe Cruise. Enjoy a welcome drink, check-in your cabin. A fresh seafood lunch will be served. At that time, we will begin our 3.5 hours cruise through mystic Ha Long Bay to see the amazing karsts with different formations: Mat Qui (Monster's face) islet, But Moc islet, Cap De islet, Trong (Drum) cave, Trinh Nu cave, floating fishing village, with its unique way of life. - Early birds can attend a Tai Chi demonstration on the sundeck at the break of dawn. Start the day enjoying some Paloma delights with a colourful buffet breakfast. - Free at leisure and overnight in Hanoi. 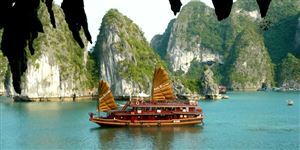 - After breakfast, head for Tam Coc and board a small boat for a peaceful cruise up the river (Tam Coc is also referred to as the Halong Bay on land). 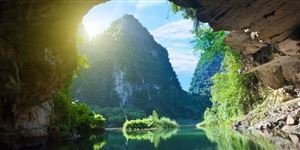 Tam Coc is best explored by boat as there are a series of linked caves. Be enchanted while rowing through these natural wonders. Then, visit Bich Dong (Blue Grotto). - After lunch, back to Hanoi. Free shopping at local specialty supermarket. - Have dinner at a local restaurant.